A proper setup is key to a good swing. Golf has grown in popularity in the last decade. 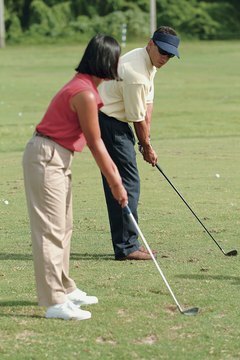 Anyone can start the game at any age, and all you need to get started is some good advice about the golf swing. The golf swing is a mechanical process that needs to be perfected and repeated properly each time. No matter what you do with a golf swing, you will find that it goes much better when you take it nice and easy. You see professionals taking deep and slow breaths before they strike the ball on an important shot, and there is a reason for this. Your golf swing should be in tempo with your breathing, and that is why professionals attempt to maintain their breathing in important situations. Learn to use your breathing as a tempo indicator with your golf swing and you will find that you can maintain a smooth tempo in any situation. You will hear the phrase "square to the target" frequently if you take golf lessons. It means you want to try to make sure you are facing the right direction when you are getting ready to swing the club. Your shoulders should point at the target, and your feet should line up squarely under your shoulders as you address the ball. As long as you are pointing your shoulders and feet squarely at the target, you should be able to get the ball where you want it to go. The teaching phrase "keep your eye on the ball" has been used so often that it has become a punchline for many jokes. Keeping your eye on the ball is something people are taught, but they are sometimes not told why they need to keep their eye on the ball. When you keep your eye on the ball, you are keeping your head down during the swing. If you do not allow your head to come up, then it is impossible for your shoulders to come up. That means you are able to keep your shoulders in place throughout your swing if you keep your eye on the ball. If you lift your head with your swing to watch the ball fly, then you will lift your shoulders and probably miss the ball completely. Keeping your eye on the ball also helps to improve your chances of making solid contact with the ball. Pick out a spot on the back of the ball that you want to contact with the clubface and then focus on that spot as you swing the club. You will find that if you practice this enough, your hand-eye coordination will improve dramatically, and you will consistently make solid contact with the ball.